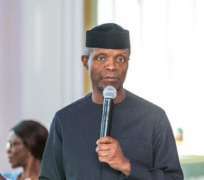 Vice President Yemi Osinbajo says Nigeria suffered major infrastructural deficit in the 16 years of the Peoples Democraty Party's (PDP) rule. He stated this on Friday in Abuja at the 2019 Vice Presidential Debate organised by the Nigeria Election Debate Group in collaboration with the Broadcasting Organisation of Nigeria (BON) and Civil Society Organisations. He added that corruption is the major cause of the country's current challenges which must be tackled head-on. He argued that Nigeria's Gross Domestic Product had consistently gone up under the All Progressives Congress (APC) led administration which he added was building the country's infrastructure, especially the road and rail sector. While acknowledging issues of poverty in the county, Osinbajo said the administration's social investment programmes were put in place to address poverty in the country. He said the administration was investing heavily in power distribution to address problem of electricity in the country Dr Peter Obi, the PDP Vice Presidential Candidate, however, said that job creation remains the key to addressing insecurity and other anti-social vices in the country. He decried inequality, poverty and high crime rate in the country which he said was caused by unemployment. Obi stressed that the country's main problem is its economy which he said is under the preview of the Vice President, adding that he would do all it takes to set the country's economy on the right footing if his party is voted into office in 2019. “The vice president has a role to build the economy and make the country work, fighting corruption is not a policy,” he said. He assured that he would remain loyal to the President and Nigerians, adding that he had never had issues working with people. Obi further said there was need to review the country's subsidy regime in the interest of the nation, adding that if the right thing was done, the price of petroleum products would drop. He said the PDP government would properly support Small and Medium Enterprises in the country as well create enabling environment to attract foreign investors. Also speaking at the debate, Mrs Umma Getso, Young Progressives Party Vice Presidential Candidate said the girl-child education and women empowerment was her priority. She stressed that her party had all it takes to move the country to the next level, adding that subsidy in petroleum products was a scam and should be removed completely. She emphasised the need to rebuild the country's economy which she said is all encompassing, adding that her party would ensure constitutional restructuring and electricity redistribution. Alliance for New Nigeria Vice Presidential Candidate, Khadijah Abudullahi-Iya said her party if voted into office, would ensure transparency in government's institutions, diversify the economy and address issues surrounding petroleum subsidy. She also said that her party had in place policies that would address unemployment, and encourage free trade to grow the economy. Alhaji Ganiyu Galadima, Allied Congress Party of Nigeria Vice Presidential Candidate said his party would work with technocrats to develop the country's economy and make her the envy of other nations. He said his party would privatise all government business to make them more productive.